The contents of this database are in our new Collection SearchBETA. Try it today for an improved search experience! Rt. Hon. W.L. 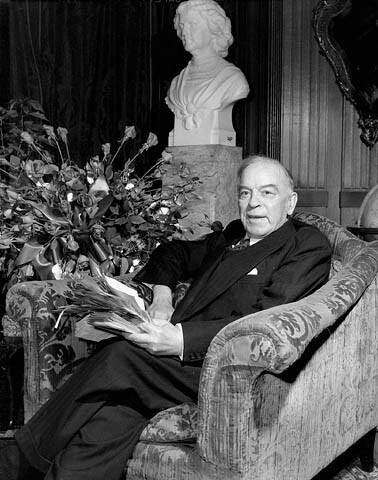 Mackenzie King on his 75th birthday. There are approximately 50,000 pages available for you to access in this database of the Diaries of Prime Minister William Lyon Mackenzie King, MG26-J13. This research tool provides access to the Diaries of William Lyon Mackenzie King (MG26-J13). The Diaries are a rich historical source that describes Canadian and world events from the unique perspective of Canada's longest serving Prime Minister. Mackenzie King kept a daily diary - with a few exceptions - from 1893 to a few days before his death in 1950. After his death, a controversy emerged over an ambiguous demand in Mackenzie King's will to have the Diaries destroyed. The literary executors for Mackenzie King, including the Dominion Archivist of Canada, decided to keep the Diaries thus ensuring their literary and historical legacy. As Mackenzie King began his Diaries when he was still an undergraduate, the documents provide a rare and important chronicle of his thoughts and actions from young man to well-regarded academic, high-ranking civil servant and world leader. The Diaries, when stacked in a row, span over seven metres in length and comprise over 50,000 manuscript, typed and transcriptive pages of text. Mackenzie King originally wrote his diaries by hand until the beginning of 1938. Afterwards, Mackenzie King dictated his Diaries nightly to his secretary. After his death, portions of the earlier Diaries were transcribed to aid researchers. In the 1960s, the Diaries were preserved on microfiche by the University of Toronto Press and were distributed to select libraries and archives. It is the microfiche version of the Diaries that were scanned and are now presently available through this research tool. While we have endeavoured to make the images from the Diaries as clear as possible, some will be harder to read due to the condition of the original microfiche from which they were scanned. The Diaries of William Lyon Mackenzie King are comprised of approximately 50,000 pages of text. The database, on which this research tool is based searches 30,000 pages of typed and transcriptive text for keywords, phrases, or dates. The original Diaries were never fully indexed and this database gives researchers an unprecedented opportunity to explore the content of Mackenzie King's writings. However, due to character abnormalities, misspellings and abbreviations in the original text, not every incidence of a specific keyword, or phrase can be found. In addition to the keyword, or phrase function the Diaries can also be searched by specific dates, or be read page-by-page. Researchers should use the multiple means of searching provided to increase their success in finding diary entries. To further assist the researcher, key dates, events, and people in the life of Mackenzie King can be found on the archived website: A Real Companion and Friend: The Diaries of William Lyon Mackenzie King (Archived). From 1893 to the late-1930s, Mackenzie King wrote his diary by hand in a small, difficult-to-read script. Later, after Mackenzie King's death in 1950, the handwritten portions of the diary were transcribed. It is these transcribed pages, along with the originally-typed pages, that are searchable through the database. The transcriptions, however, are abridged and do not follow the written texts exactly, sometimes leaving out sections that were considered extraneous, or too personal. The original manuscript pages of the Diaries are accessible, but because of their handwritten nature cannot be searched directly using the database. Furthermore, the quality of these original pages varies depending on the clarity of the microfiche from which the images were taken. The Diaries of William Lyon Mackenzie King are a very rich archival source that can appeal to many audiences and can be used in myriad ways. For example, historians and researchers who have had access to this source for many years will now be able to search the many unindexed pages for nuances that may have been overlooked in previous research. Countless researchers, from students to genealogists to casual web surfers, can use the keyword search function to see if any specific people or places caught the attention of Mackenzie King. The Diaries give an unprecedented view of late-nineteenth to the mid-twentieth century Canada and the world from the perspective of an individual well-situated to report on these events. Like any historical source, the Diaries must be read within the context that they were created. It is important to remember that the Diaries were written over a period of fifty years in the life of Mackenzie King. The keyword search capability makes it very easy to pinpoint certain extracts from the Diaries regardless of preceding, or subsequent events. Mackenzie King's opinion, like that of anyone else, was subject to change over these years. It is better to see his writings as they compare to the Diaries as a whole, or to a certain periods of his life, rather than taking certain comments, or opinions, out of the context in which they were written. Archivists from Library and Archives Canada have written many detailed biographies and historical essays to assist in the understanding of some of the key issues and people that touched the life of Mackenzie King. These research aids to the Diaries can be found on the archived website: A Real Companion and Friend: The Diaries of William Lyon Mackenzie King (Archived). A chronology of Mackenzie King's life, as well as, a detailed list for further reading is also available on this site. While the Diaries of Mackenzie King are an excellent historical source, we recommend that a more complete understanding of the issues that touched Mackenzie King's life can only be gained with further research of other accounts and opinions.